With the latest decisions of the Chinese government to restrict rare earth exports including lithium to global markets, the automotive industry might be wise to consider other materials for batteries. One battery technology in the labs uses zinc and air; hence, it is called zinc-air, where the atmosphere is part of the chemical equation. As reported in the International Business section of the Economic Times, China is not bowing to international pressures to loosen its export quotas; and that includes lithium. Nonetheless, America should not be held hostage as it is with oil, especially when zinc supplies are plentiful. The main advantage of utilizing zinc-air batteries for vehicle propulsion is its energy availability, as zinc metal is 100 times greater than that of lithium, per unit of battery energy. The second advantage is, zinc’s supply in the world is more readily available. According to Machine Design, approximately 35% of the world's supply, or 1.8 giga-tons of zinc reserves are in the United States, whereas the U.S. holds less than 1% of known lithium reserves. This is supported by ev.world.com that reports zinc production ranks fourth in the world, after iron, aluminum and copper. Together, these are undisputed facts that automakers need to consider. Furthermore, current yearly global zinc production is, in practical terms, sufficient to produce enough zinc-air batteries to power over ten times more electric vehicles than current lithium production can support. If nothing else, it would buy the time needed until hydrogen fuel cells mature and become economically feasible to the masses. Together with nano-scale enhanced electrodes, the energy density of zinc has the potential to overcome the range anxiety associated with full electric vehicles. Fact is, zinc-air batteries have higher capacity-to-volume (and weight) ratio than other types of batteries, because air from the atmosphere is one of the battery reactants. And since air is not packaged with the battery, a cell can use more zinc in the anode; and there is plenty of supply even as a replenishing fuel. 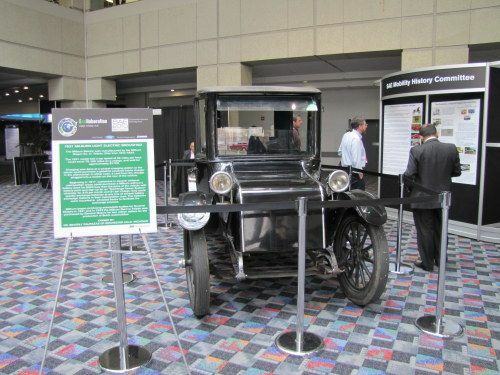 In case you’re wondering, the concept of using zinc for car batteries is not new. As far back as 1995, road tests at Lawrence Livermore national Laboratory (LLNL) underscored the zinc-air battery’s capacity to give electric vehicles some of the attractive features of gas-driven cars: a 400-km range between refueling, 10-minute refueling, and highway-safe acceleration. A key to the concept is the potential to refuel over recharging. That would be easily accomplished by replacing spent electrolyte with fresh electrolyte containing recycled zinc pellets. In operation, the fuel cell would consume all of the zinc and would be operationally quiet, providing instantaneous electrical energy with no greenhouse gas emissions. According to a Science & Technology article posted on the LLNL website, such a refuel-capable battery has clear advantages over rechargeable and replaceable batteries. For example, it can be topped off and even refueled on the roadway in case of an emergency. Energy researchers have long recognized that if a way could be found to refuel or recharge a battery simply and rapidly, would provide an electric vehicle acceptable to consumers. Putting it all together, why then is the auto industry trading one supply shortage candidate for another supply shortage, lithium for oil, when there is far more zinc to go around? When commercialized, a zinc-air battery has the potential to be the least expensive advanced battery on the market. Zinc Air Inc., a privately held corporation headquartered in Kalispell, Montana, is already focused on the development of sustainable energy storage solutions for transportation and smart grid applications intended to provide high levels of efficiency at low costs. It secured proprietary technology when it obtained exclusive rights from LLNL for the zinc-air fuel cell (U.S. Patent 5,434,020) invented by John Cooper, a retired LLNL chemist. It is a mechanically rechargeable zinc-air fuel cell for remote power and transportation applications. Aside from currently conducting tests on its prototype with field tests expected in early 2011 for a grid storage system, the company is in discussions with multiple fleet vehicle manufacturers, and has committed to full-scale field testing in the second quarter of 2011.